Klopp has never lost a two-legged European tie as Liverpool manager, winning all nine. His only defeats in the knockout stages of European competition have come in one-off matches - the 2016 Europa League final and the 2018 Champions League finalLiverpool should have scored more than two goals against Porto on Tuesday night but I don't think it will make any difference whatsoever to the outcome of the tie.Porto looked, at best, like a middle-to-bottom Premier League side, and I did not see anything from them at Anfield that will worry Reds boss Jurgen Klopp for next week's second leg.This was the quarter-final of the Champions League, when you are expecting to be up against the best teams in Europe, but Porto were a long way short of that kind of quality and it was a totally routine win for Liverpool. Klopp's side played some good football at times and, with no injuries and hardly any drama or scares, it was just the kind of night that they wanted before they resume their Premier League title bid against Chelsea on Sunday.They have got the best part of five days to recover and prepare for that game, and they have hardly had to strain themselves here in the first place. Liverpool had 64% of possession against Porto, and had 15 shots at goal compared to eight by the Portuguese sideThe Portuguese league does not have the same intensity as the Premier League and Porto could not cope with Liverpool's pace or ferocity as Klopp's side went forward in the first half.Liverpool were given the kind of space in the final third that they are just not used to getting from opponents in the Premier League, with their two goals a good example of that.I know Porto had a couple of chances themselves but they did not really do enough in attack or defence to make things difficult for Liverpool. They were second-best in every area of the pitch. Mali striker Moussa Marega had Porto's best chances at Anfield. He was on target with three of his five efforts, but could not beat Reds goalkeeper AlissonI felt from a very early stage that it was a very easy night for Liverpool and they knew it. I got the impression that if they had really needed to score a third they could have done.In the last 20 minutes, the Reds were not quite going through the motions but they had lost their cutting edge going forward and were just looking to shut the game down.That just showed how comfortable they were. It seemed like Klopp had decided 2-0 was good enough, and was more bothered about not conceding than really pushing for more goals.He would have taken that scoreline before the game anyway, but now he will also know just how superior his side are. Liverpool reached last season's final, where they lost to Real MadridLiverpool should be able to cruise through the second leg, which will help their Premier League title bid too. Manchester City do not have that luxury after losing the first leg of their quarter-final against Tottenham.Yes, there is the chance Porto get an early goal at Estadio do Dragao next Wednesday, and start to put Liverpool under some pressure.But with the way Liverpool are set up, and the threat they pose on the counter-attack, the way the tie is poised suits them perfectly. Porto will have to come at them, and the Reds can just play on the break.And, if there were any concerns abut Liverpool's form or tactics on the road in Europe this season after they lost all three away games in the group stage, their performance in Munich in the last 16 ended them.I have total confidence they will finish the job in Portugal next week. 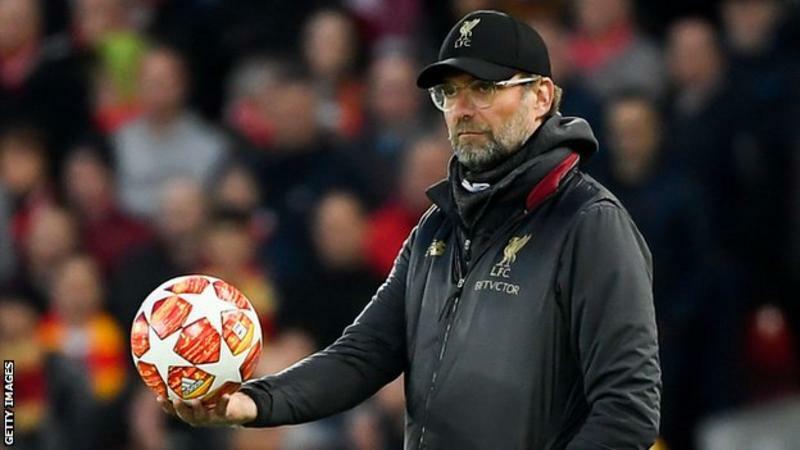 That would set up a semi-final with Barcelona or Manchester United but there is no way they will be thinking about that at this stage - Klopp does not allow his players' concentration to drop. The top two are both in action on the same day this weekend. Manchester City play at Crystal Palace on Sunday (14:05 BST kick-off) with Liverpool hosting Chelsea immediately afterwards (16:30 BST)The focus now goes back on to the Premier League title race. The visit of Chelsea on Sunday is a big moment, but I think Liverpool are ready for the challenge.The worry for them is that Eden Hazard turns up and plays at the same level he did against West Ham on Monday because, when he does that, he is very difficult to stop.But Chelsea usually have to have a lot of the ball for him to do that, and I am not so sure that will happen at Anfield.Liverpool know what they have to do to have a chance of winning the Premier League - at the moment it is out of their hands, but they have to win every game, and hope City slip up.It has been the same for them every week since Christmas. If you had posed the question 'what do Liverpool need to do?' before every game, then most of the time the answer would have been 'win'.It is the same on Sunday, so what's new?Mark Lawrenson was speaking to BBC Sport's Chris Bevan.